PR | Τα Πάντα για την Επιστήμη των Δημοσίων Σχέσεων. 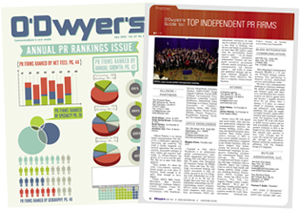 O’Dwyer’s magazine, now in its 27th year, is the #1 publication for PR and marketing communications pros. The magazine has been in full text on LexisNexis since 1989–the only PR magazine on LN. The magazine focuses on the firms and individuals making news in PR as well as offering articles on industry trends. Our January issue contains our annual Buyer’s Guide section, a de facto 60+ page directory devoted to the companies that supply the PR industry with products and services. For a comprehensive list of services such as media training, video production, celebrity talent, executive search, camera ready releases and much more, PR people refer to our Buyer’s Guide. January, PR Buyer’s Guide/Crisis Comms. August, Prof. Svcs. & Financial/Investor Rels.